Though there is only one game remaining in the 2018-19 NFL season, there is a silver lining we can all look forward to. With draft season comes the 2019 Senior Bowl, where some of the draft's best prospects will put their talents on display all week long. Despite not having a first round pick this year, the Dallas Cowboys will have ample opportunity to improve their roster through the NFL Draft. And if Stephen Jones' recent comments mean anything, Dallas might be looking to take a tight end with their second round pick in April. And while the best tight ends in this upcoming class are underclassmen, there are some seniors who can make a name for themselves among Cowboys Nation. So, let's take a look at the Senior Bowl rosters and identify three tight ends you should keep an eye on this week. If the Cowboys are looking to add a "modern" style tight end on day two of the NFL Draft, Dax Raymond just might be their guy. At 6'5" 250 pounds, Raymond has impressive movement skills, looking rather fluid for a player of his size. The Cowboys have lacked a middle of the field seam-buster at tight end for quite some time, and there is reason to believe Raymond can become that guy. With a wide catch radius and rather consistent hands, Raymond's ability as a pass catching tight end is not under much scrutiny. As a run blocker Raymond is inconsistent overall, but is certainly not a bad option as an in-line tight end. Personally, I believe Dalton Schultz will be a better run blocker over time, but Raymond can provide the flex ability as a receiver which Schultz might not have. While Dax Raymond provides more as a receiving threat, the Cowboys should consider LSU's Foster Moreau if they are looking for some extra pass protection and run blocking for Dak Prescott and Ezekiel Elliott. With blocking as his best trait, Moreau didn't offer all that much in terms of pass catching production at the collegiate level. And, beyond just college stats, Moreau's skillset isn't one of a modern pass catching tight end in the NFL either. Still, the Cowboys should keep an eye on Moreau at the Senior Bowl. Despite what some may think, Dallas doesn't have a true blocking tight end, even if Schultz developed nicely throughout his rookie year. Most scouting reports cap Moreau's upside as a TE2, which could keep him off the Cowboys radar on draft day. Let's get back to the pass catchers, shall we? 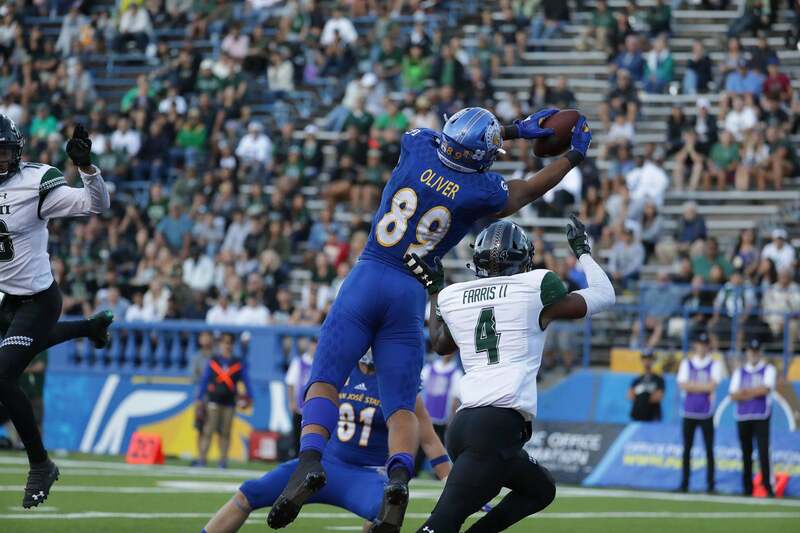 San Jose State's Josh Oliver is a height-weight-speed guy that should do well in the coming weeks. At 6'5" and 253 pounds Oliver moves well, and could make coaches believe he can be their big red zone target. Catching 56 balls for over 700 yards and 4 touchdowns last season, Oliver clearly has the receiving skills Dallas may covet out of a tight end in this draft class. Oliver is a raw route runner, and needs to learn how to harness his overall athleticism into specific football ability, but his ball skills make him an intriguing prospect going forward. Josh Oliver could also be used as a slot receiver in the Cowboys' scheme, attacking the middle of the field and being that seam buster which fans so badly desire. To many onlookers, the safety position is considered the biggest need right now for the Dallas Cowboys. It is arguably their most talked-about spot headed into the 2019 NFL Draft, expected to be addressed with one of the team's highest picks. After sending their first-round pick to Oakland for WR Amari Cooper, the Cowboys are limited in their current draft capital. Their need at safety and tight end is comparable, and I personally believe higher at TE than any other roster position. That Iloka/Witten comparison might stun you, but remember that this is 2019 and Witten just spent a year doing commentary. I'm not talking about Jason's Hall of Fame career, but just what he brings to the table this season. But you see my point; safety seems stronger across the board. Woods looks like a long-term starter and Iloka, a newly-added free agent, could have 2-3 years of solid veteran play left in him. So yes, I think TE is a greater need. But that doesn't mean Dallas won't use their second round pick on a safety. The decision at the 58th pick will come down to a variety of factors. Even if Dallas agrees with me that TE is their biggest need, will the right guy be available? Or will the depth at the position be great enough that the Cowboys decide they can afford to wait until the third round for a TE, and prefer to go ahead and grab their safety earlier? One name we've seen liked to Dallas several times in draft prep is UVA's Juan Thornhill. He converted from cornerback to safety last year, which means he has the man-on-man coverage skills that the Cowboys love for the position. That kind of player being available at their second-round pick will push the Cowboys hard to take safety. He might even be able to come in and compete for a starting job right away. In fact, we could see a trade-up this year. With two fourth-round picks this year and their fifth, Dallas could try to work their way higher into the second to land someone they really like. Thornhill is just the kind of talent they might be willing to do that for. Of course, there are plenty of other safety options the Cowboys might like better. And if they have their eye on someone who could fall into the middle rounds, such as Alabama's Deionte Thompson or Boston College's Will Harris, perhaps they wait a short time and address TE, DT, or RB with their early picks. But I don't see Dallas waiting on a safety this year. For all I know, they just might see it as their top need. At the least, it's probably in their top 2-3. Given that, I expect to see one drafted on Day 2. The Dallas Cowboys have general depth across the roster right now, but you can't include the running back position in that statement. Ezekiel Elliott is a superstar but Rod Smith is a free agent and the rest of the RBs have barely any playing experience. Could Dallas use the 2019 NFL Draft to fill this need? Zeke will be in Dallas for at least two more years, and hopefully well beyond that. He has one year left on his standard rookie contract and now has the fifth-year option added for 2020. The Cowboys claim to want a long-term deal with Elliott and will likely get that figured out sometime next year. As good and as durable as Zeke is, it's still dangerous to put all of your RB eggs in one basket. The Cowboys have gotten by with Rod Smith as their backup the last two years, though they may have suffered a bit during Elliott's 2017 suspension. A more dynamic player could've helped them then, and is probably even more important to find now. Darius Jackson is the current RB2, and though he's flashed athletic ability during preseason games there's been no production in real NFL action. He has six more carries in his career than our other reserve, Jordan Chunn, who spent all of last year on the practice squad. If the Cowboys are serious about championship contention going forward, can they risk having such a weak depth chart at running back? If Ezekiel Elliott were to go down, he could take any hopes of the Super Bowl right with him. Free agency is one way Dallas could solve this problem. There are still some solid veterans out there like Jay Ajayi, Doug Martin, or Spencer Ware. They could even re-sign Rod Smith, at least getting system familiarity and strong special teams play out of their backup. However, having not signed any of those veterans yet, it seems Dallas may be focused on the 2019 Draft to find their backup running back. They likely will turn to a free agent if they don't come away from this weekend with a solid rookie. It will be interesting to see how this draft goes with the running back class. There are no Elliotts, Barkleys, or Fournettes in this group; 2019 could be a year where no RB gets taken in the first round. There are two sides to that coin. On the one hand, it means Dallas could potentially land a top prospect like Penn State's Miles Sanders with their second-round pick. But it could also means that this entire RB group is suspect; a weak class that could lead to a lot of disappointments all around. Another scenario is that other RB-needy teams scoop up top names before the Cowboys come on the board. If that happens, Dallas will likely use the 58th pick on another position and hope to find a steal at running somewhere on Day 3. In truth, I don't expect the Cowboys to take any RB as high as the second round. The potential is there if the right guy falls to them, but it would be unwise to pass on a potential starter at safety, tight end, or some other spot just to draft Zeke's backup. If they do draft a RB early, Dallas could be making a pretty big statement about how committed they are to Elliott beyond 2020. What seems far more likely in this draft is that the Cowboys will use a mid-round pick on a guy like Bryce Love, whose pure speed make him a nice change-up player behind Elliott. A guy like Love doesn't threaten Zeke's status as the top dog, simply giving the offense a new toy to work with. With two picks in the fourth round and one in the fifth, this seems a pretty good range for where Dallas will find their backup runner. They will likely go with some combination of TE, DT, and S with their first two picks on Friday night. Even if the Cowboys do draft a RB this weekend, don't be shocked if they still add one of the veteran free agents. They may bring in a guy simply for insurance during training camp and the preseason. And at this point in the offseason, they should be able to sign him for a minimal deal. We'll find out soon just how Dallas plans to address their backup RB position. Will it be with an eye to the future, perhaps wanting to guard against any contract issues with Ezekiel Elliott? Or will it be a player who clearly is here to supplement Zeke rather than replace him? After months of anticipation and buildup, the 2019 NFL Draft is finally upon us! Yes, the Dallas Cowboys are without a first-round draft pick due to the Amari Cooper trade, but in my opinion this just makes this years draft that much more exciting. I don't know about you, but I'm already on the edge of my seat waiting to find out which prospects will still be on the board for the Cowboys at 58 in the second-round. If the Dallas Cowboys absolutely had to be without a first-round draft pick, this is probably the best year to not have one. The 2019 draft class is pretty deep at several positions the Cowboys could be targeting. They should be able to come away with some talented players who can come in and improve the roster as rookies. There may not be very many starting jobs up for grabs, but make no mistake, these incoming rookies are the future of the organization. I have a sneaky suspicion the safeties the Dallas Cowboys could be targeting at 58 will be wiped out, which could put them in no man's land in regards to the positions they could be targeting. Trysten Hill may be a little bit of a reach here, but I doubt he makes it to 90. He is the athletic, disruptive DT Rod Marinelli covets in his defensive front. He has the versatility to play the 1 or 3-technique and should push Maliek Collins for playing time as a rookie. Mecole Hardman has the potential to be the versatile weapon the Dallas Cowboys are currently missing on the roster. He can be a deep threat, "gadget" player, return specialist, emergency CB, and a key member on special teams. He's still a little raw as a WR prospect, but has the makings to become something great and would provide a really a good insurance policy if Randall Cobb continues to struggle remaining healthy. I believe he will develop into a Tyreek Hill type of offensive weapon in the NFL in a year or two. Ideally either Jace Sternberger or Dawson Knox falls to the Cowboys here with the first of their fourth-round picks, but Kahale Warring is the next best thing. He is still a little raw, but has the strength and athletic ability to be a future starting tight end in the NFL after a little seasoning. Playing behind one of the best TEs to ever play the game in Jason Witten could be exactly what Warring needs to put his development on the fast track. 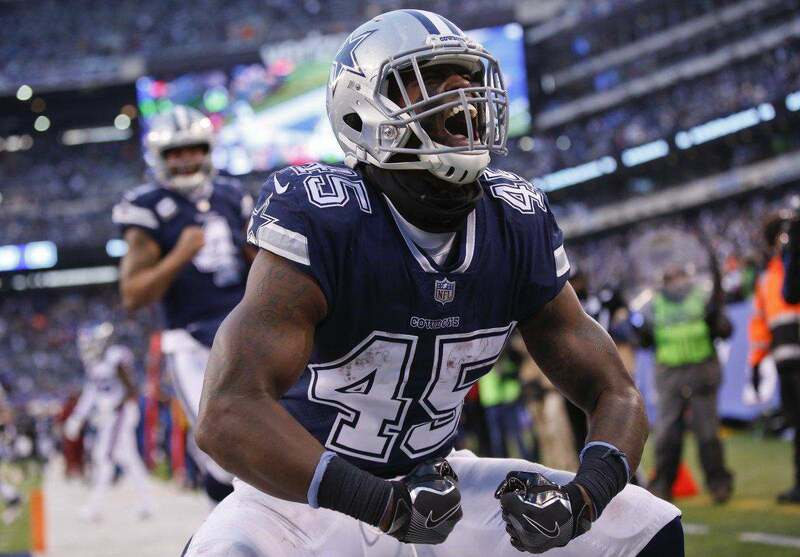 The Dallas Cowboys have been pretty forthcoming about adding a "starting caliber" RB behind Ezekiel Elliott, and Alexander Mattison fits the criteria. He is a crafty runner who runs with good vision and patience, which allows his blocks to set up. He is a big, physical back with only average straight-line speed, but his tenacious mentality as a runner wears down defenses and reminds me a little bit of Marion "The Barbarian" Barber. He has every-down back potential and would make a really good RB2 behind Zeke. The Cowboys may have missed out on one of the most athletically gifted safeties in the draft at 58 in Juan Thornhill, but Sheldrick Redwine is a nice consolation prize. He had the second best SPARQ score amongst all safeties this year behind only Thornhill and surprisingly has the same type of skill set and versatility. His background at CB shows up in coverage, but he needs to become a much more reliable tackler and take better angles in the running game before he can be relied upon. He has starting potential though after little a more seasoning. 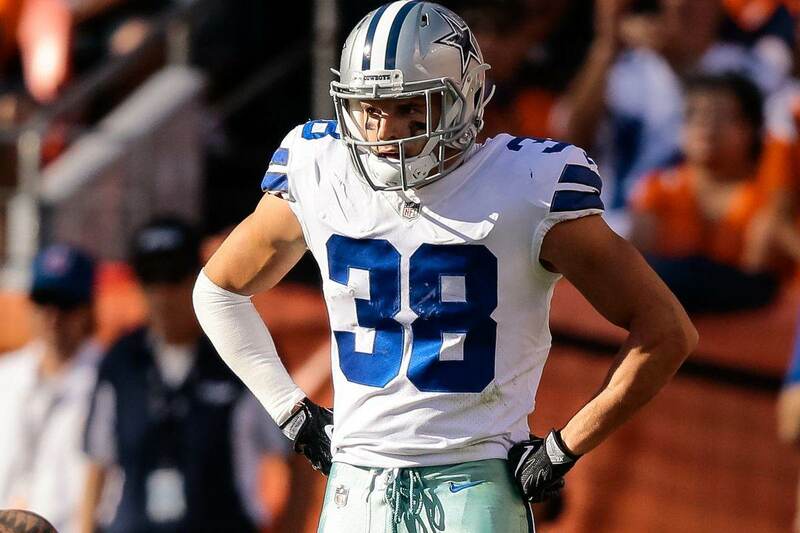 I wanted to give Kris Richard a new tall, lengthy CB here in Chris Westry or Derrick Baity, but I think the Cowboys can get one of the two as an undrafted free agent. Cole Holcomb on the other hand wouldn't go undrafted in my opinion, hence his selection here. He is an instinctive and athletically gifted linebacker who played all three LB positions in UNC's 4-3 defensive scheme. He has starting potential, but would be a depth and special teams contributor as a rookie.